Formed officially in 2010, the club has been a impromptu organization for several years. Club membership consists of a small core group of Coach Choo's family and running friends, with the mission of promoting high school cross country in Eastern North Carolina. The group provides free meet organization and timing services to the high school programs in the area. The group also donates time and resources to camps and clinics for the high school running community. Coach Choo is Charlie Justice. At an early age he earned the nickname of Choo-Choo (from a famous football player named Charlie “Choo-Choo” Justice). He is a versatile individual who has always been involved in athletics, has spent years as a coach, teacher and has always been a runner. Currently he coaches DH Conley High School XC/T&F, but his day job is teaching MIS Instructor (Management Information Systems) classes for ECU College of Business. His time spent coaching earned him the nickname of “Coach Choo”. Coach Choo and his wife Sharon have worked for years to promote running in Eastern North Carolina. Choo first began running in 1975. Always the littlest in his class he discovered he had a talent for running. At Southwest Onslow HS in Jacksonville NC, he set school records in several events. Choo attended East Carolina University on a football scholarship, not because he playing ability but because of his work as an athletic trainer and equipment manager. At the time ECU did not have a cross country team and the track team focused solely on sprinting. He spent his undergraduate years working with the ECU football team, which limited his time to train and compete on local road racing circuits. Upon graduation he resumed competitive running, racing for Team Athletic World, North Carolina Road Runners, and then Team Asics-Tiger. Self coached, and training with some of the state’s top runners, he began to develop training philosophies that he still employees today. He recorded personal bests of 15:08 in the 5k, 25:26 in the 8k, and 32:04 in the 10k. In 1988 he was a member of the Team Asics-Tiger squad that placed 3rd in the 1988 RRCA National 10k championships. In 1986, while working for the ECU Athletic Department, Choo joined the coaching staff of ECU Track program, working with Coach Bill Carson. The ECU program was nationally recognized for it’s sprint program, and Choo assisted Coach Bill Carson as he developed numerous All American sprinters, including Olympic sprinter Lee McNeil. ECU resumed its cross country program and in 1989 Choo began coaching the cross country and distance runners. Over the next few years the XC program moved from a walk-on program to a competitive scholarship supported team. In 1991 he assumed the role of the Head Women’s track coach, charged with turning the women’s team into a championship caliber program. As the women's head coach he was able to recruit numerous state champions to join the Pirate roster. By adding athletes in all event groups and starting an indoor track program for women, the program took on a new feel. The turning point came with addition of Dava Rhodes who would become ECU’s first female NCAA All American runner when she ran 35:04 in the 1994 NCAA T&F Championships. Over the next six seasons his athletes would win individual championships in the sprints, jumps, throws, distance and relay events, any several would compete in the NCAA Championships. The team earned a competitive presence by competing nationally in prestigious meets as the Penn Relays, Texas Relays, Ohio State’s Jessie Owens Classic, and the USATFCA Series. The team challenged for conference titles and became one of the top programs on the prestigious ECAC championships. For his efforts, Coach Choo was honored as CAA T&F Coach of the Year in 1996 and 1997. Following the 1999 season Coach Choo retired from college coaching in order to spend more time at home with his family, however his influence was felt for several years. In 2000 his former assistants took over the program and led them to the CAA T&F championship. His athletes held nearly every record for the women’s program when he retired. In 2007 he returned to high school coaching, starting the cross country program at Greenville Christian Academy where his daughter Andi was going to school. Following her graduation he began to assist DH Conley HS, and took over head coaching duties in 2014 while his son Dylan was competing for Conley. Since that time the program has returned to competetive status and Choo has been named ECC Coach of the year 3 of the past 5 years. in 2017 and 2018 Conley swept the boys and girls conference XC titles. In 2018 the boys team won the NCHSAA 3A region championship and finished 8th in the NCHSAA state championships. The girls team finished 3rd in the regions and 12th in the state. Even though he was no longer coaching he continued to assist ECU the program by directing championship cross country events for ECU. While coaching he had worked with local businessman Parker Overton to develop a championship cross country course at Overton’s Lake Kristi property. After developing the course and hosting several successful invitational meets they were able to bring the CAA Championships to Greenville in 1996, followed by the North Carolina Collegiate XC Championships in 1998. After coaching he continued to direct XC meets for ECU including the 2000 CAA and 2001 CUSA Championships. The success of these meets helped Choo to persuade the NCAA to bring the NCAA Regional championships to Greenville for a 4 year stint of 2003-2006, as well as a return of the CUSA championships in 2007. Also, in 2000 he created and published one of the first websites devoted to college track & field, NCTrack.com. The popular site ran until 2006, and had thousands of hits monthly. High school meets have been a passion of Coach Choo’s. In 1997 he directed the initial Pirate HS XC Invitational. The meet was aimed at kick starting local high school cross country programs. The Pirate Invite grew each year, annually attracting over 800 high school runners (and many of the top teams) from across the state until its final year of 2017. In 2010 he assumed the role of directing the Bo Run, and the meet has grown to feature over 1000 high school and middle school runners each year. Choo has also directed several of the NCHSAA regional xc championships. In addition to Cross Country meets, Coach Choo has been involved in directing and/or timing numerous road racing events in Eastern North Carolina. In 1986 he helped start the Fiesta Biathlon, an event that still continues 30 years later. The most successful of his events was the Annual Pirate Chase held during the 90’s. The 5k race annually attracted a stellar field of North Carolina’s top road runners, and twice produced results where the top ten finishers all recorded times in the 14 minute range. He has worked with top events like the annual Capital City Classic 10k in Raleigh, NC which doubled as the NC-USATF 10k Championship for several years. In 2000 Coach Choo returned to running following a seven year break while he was coaching at the college level. 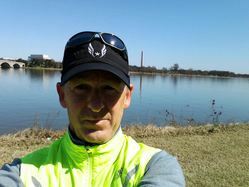 After a few years of recreational running with a few races he took up running marathons at age 40, became involved in several local running groups, and mentored several post collegiate runners. He works regularly with high school track and XC coaches in the eastern NC area. Since his return to running he has run several marathons including the Boston Marathon on three occasions, and the New York City Marathon. He is an active participant on the NC-USATF championship circuit, where finished as 2nd Master runner in the 2008 NC-USATF Marathon championship, the 2010 NC-USATF half marathon and 10 mile championships, as well as 2nd Master in the 2013 NC-USATF 10k championships. Most recently at age 50 he has recorded times of 17:48 for the 5k, 37:28 for the 10k and 2:58:32 for the marathon, and scored victories in several local road races. In 2012, at age 49 he placed 146th out of over 36,000 runners at the Cooper River Bridge 10k run in Charleston, SC. In 2013 he ran 2:58:32 in the Boston Marathon, and also placed 300th overall (3rd in the 50-54 age group) out of 55,000 runners at the USATF 10k Roadrace championship at the Atlanta PeachTree Road race with a time of 37:50.